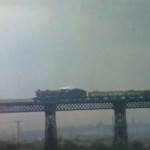 A steam train crossing Bennerley Viaduct. Click on the image to view footage. 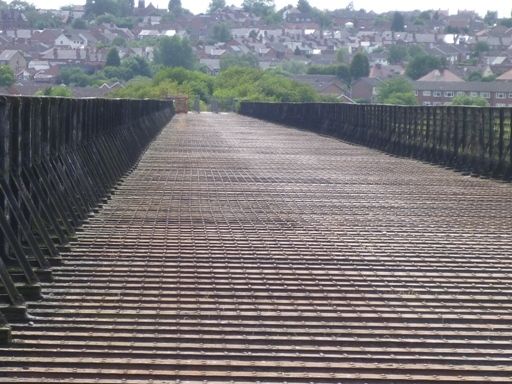 The 16 lattice-work spans of Bennerley Viaduct have straddled the border between Nottinghamshire and Derbyshire for the past 135 years. It lies a mile to the north east of Ilkeston, and at more than 1400 feet long and 60 feet high, Bennerley has towered over the Erewash Valley since it was built to carry trains to the rich coalfields of the region as part of the Great Northern Railway Extension. Bennerley is in fact one of only two wrought iron trestle viaducts left standing in the UK, and is a Grade II* listed structure. It was built in 1877 and, remarkably, is a distant relative of the Eiffel Tower, having been modelled on the design for a high girder bridge over the Creuse Valley in France by Gustav Eiffel who went on to build the iconic Parisian landmark. To avoid the problems caused by mining subsidence, the builders of Bennerley were looking for something that was lighter than the traditional brick normally used to build bridges and viaducts in the UK, and Eiffel’s relatively lightweight wrought iron bridge design provided the answer. The railway line that crossed Bennerley closed in the mid 1960s and a number of moves were made to demolish this iconic structure throughout the 1970s and 1980s (adding to one attempt in 1917 by a German Zeppelin). However the viaduct was taken over by RPL in 1998 and it sits and the centre of a proposed network of routes that Sustrans is keen to develop between Nottingham, Awsworth, Ilkeston and beyond to Derby. 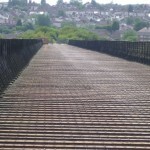 A recent study written for nearby local authorities details the central role the viaduct would play in a new network of cycling and walking routes across the Erewash Valley; and Sustrans is actively looking for opportunities to create this network which would give this hidden gem a new lease of life.